Our clients have owned this property for a number of years. They know it well and love its varied features. They were looking for a sustainable and site-sensitive project that would preserve its topography, vegetation, and natural appearance. The lakefront site is entirely wooded. It is crossed by a stream on its south side and has a steep incline on the north. These characteristics and the need to build at a distance from the stream suggested a lengthwise placement, with the house slipped in between the stream and the slope. We chose to create a low-profile, primarily single-storey building. Its meandering shape is determined by the opportunities offered by the surrounding landscape. The structure bends, opens, and narrows like a river carving its own path. 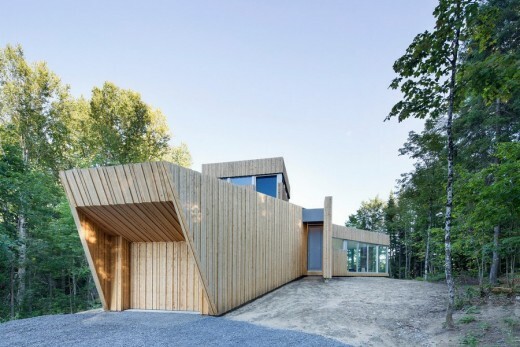 The form is clad in a single material, with vertical cedar slats of varying width and thickness placed in an open-work manner. The building’s weatherproofing is assured beneath the spaced slats, which conceal the flashing, drip edges, and trim usually visible on the exterior of traditional wood structures. The surface reads instead like a palisade that follows the shape of the building and into which openings have been cut. From the path leading up to the entrance, the building appears as a mostly opaque volume that follows the contours of the site. The garage is concealed from view. To the right, an opening in the palisade invites visitors to come inside. 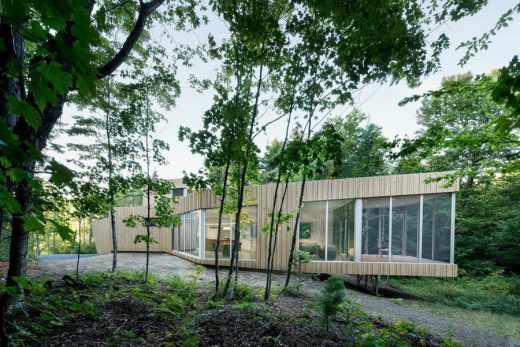 Along the south facade, the volume of the house bends and opens up to let in the light and make the most of the forest view. Further along, the volume bends again, turning toward an opening in the woods that offers a view of the stream flowing into the lake. 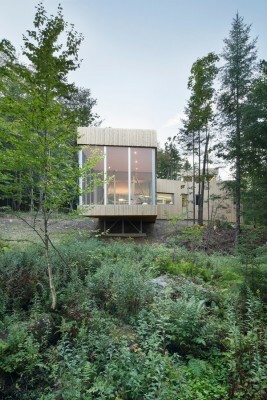 On the north side, smaller openings frame perspectives of the surrounding landscape and allow the building’s occupants to enjoy the gentle murmur of the stream, which still runs over the property. 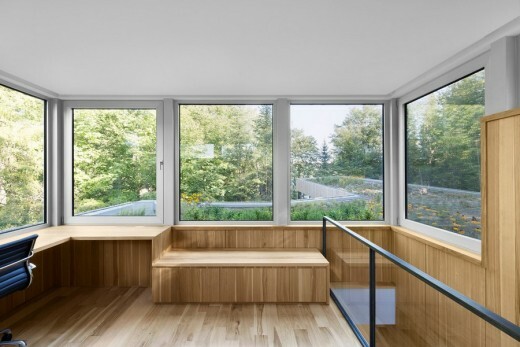 Atop the roof, a small tree-house-like room looks out onto the surrounding greenery. With time, as the cedar slats fade and the trees and ground cover grow back in around the building, architecture and nature will intermingle. Nature will also be invited to cover the building itself, thanks to its green roof. Seen from the rooftop study or the hill, the structure will blend into its natural environment. Inside, visitors are greeted by a large hickory wall unit, shaped to offer seating and a place to hang away coats. 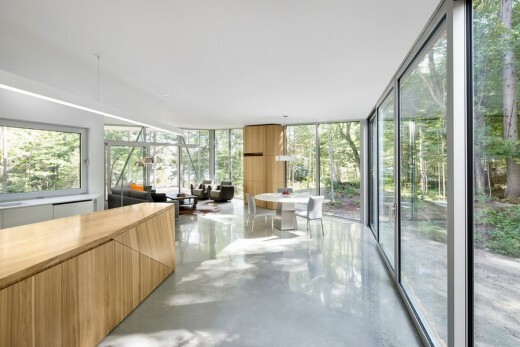 It also directs one toward the living space, a large, generously-lit area that culminates in a cantilevered, screened room with a view of the mouth of the stream and the lake. 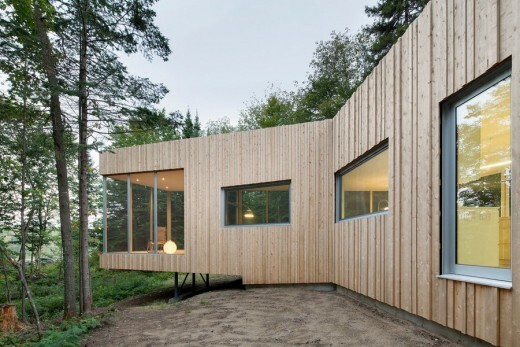 On the south side, the exterior wall makes way for a large glazed surface that opens onto the forest. 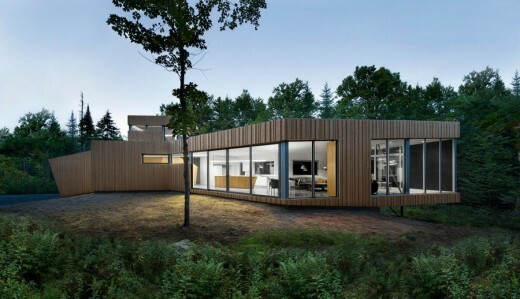 During summer, the trees, like the green roof, create a natural screen to shield the house from heat. In winter when the leaves have fallen, sunlight filters through the forest and floods the space with warmth and light. The materials used for the surfaces are simple and refined. The white walls and polished cement floors contrast with the rugged natural surroundings, allowing the scenery outside to take centre stage. The large open area is occupied by three wooden masses. 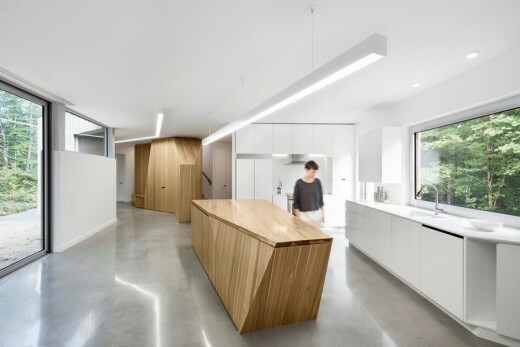 They are placed along an axis that draws one through the sequence of spaces that make up the living area. Made of hickory, these built-in units include the storage and bench unit in the entrance, the kitchen island, and a television and sound system cabinet. Their functions are barely legible, allowing them to remain as abstract as possible in order to emphasize only their form, material, and relationship to one another. 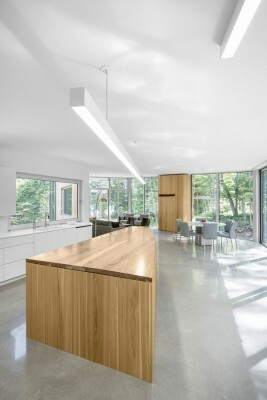 The kitchen island is in the center of the space, offering a panoramic view of the surrounding landscape. The large built-in unit in the entrance also screens off the more private areas of the home. 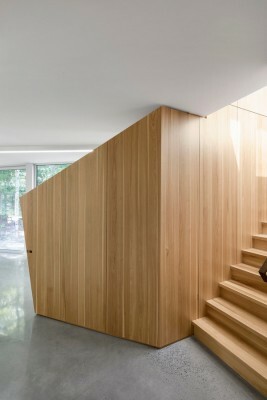 Tucked in behind the ample wooden structure is the access [H1] to the bedrooms, as well as the staircase that leads to the reading room atop the green roof. Upstairs, the wood-panelled space offers a quiet retreat from the rest of the house.